Indianapolis (March 27, 2018) – The 2018 Grand Arch Council (GAC) T-shirt contest has come to a close and Blake Stephens (Texas ’17) has been named the winner. Stephens’ design was tabbed the favorite of four finalists, garnering nearly 46 percent of all votes. The design will be for sale at GAC. A limited quantity will be available, as attendees interested in purchasing a shirt are encouraged to do so at their earliest convenience while supplies last. Stephens’ victory in the contest was due in large part to a late voting surge that transpired over the final few days of the contest. Having trailed in the voting totals early, Stephens took the lead with just three days remaining and held on to secure the win. He beat out the closest design by just 28 votes. 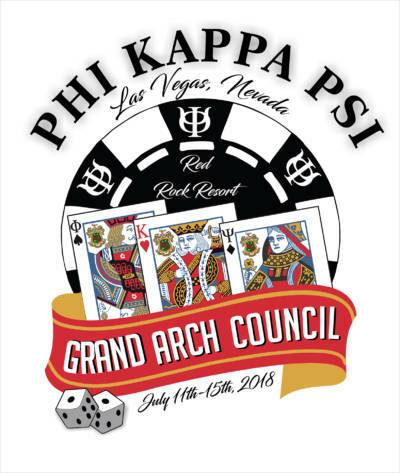 The 79th Biennial GAC, the supreme governing body of the Fraternity, takes place July 11-15 in Las Vegas, Nevada, and registration is currently open on our website. The event will be hosted at the Red Rock Resort. To see the other designs in the contest, visit our GAC T-shirt Contest page. Congratulations to Stephens and a thank you to all who submitted designs.